^ Grosvenor, Edwin S; Wesson, Morgan (13 May 2016). Alexander Graham Bell. New Word City. ISBN 978-1612309842. In 1881, the old rivalry between Bell and Thomas Edison spilled over into the field of publishing. 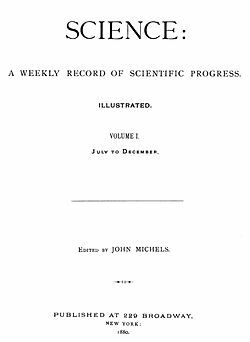 Science Magazine had been founded the year before with funding from Edison, but the frugal inventor soon tired of the deficits and withheld support. Bell had written for the magazine and respected its editorial quality. He felt that Science, like the British Nature, appealed to a broad audience interested in current research. In 1882, he and Gardiner Hubbard acquired the rights to Science and hired as editor a respected young entomologist and riter named Sam Scudder, who happened to be a Hubbard cousin.